Para deixar uma mensagem sobre a limpeza deste artigo, por favor adicione-a na página de discussão do mesmo. Este artigo é sobre the historical figure. Para the book, veja Mannimarco, King of Worms. Mannimarco, an Altmer lich, is the leader of the Order of the Black Worm and an enemy of the Mages Guild. He is also known as The King of Worms, though it is unknown whether that title is specific to him or if he holds it as the leader of his cult of necromancers. Around 3E 433, he launched an all-out attack against the Mages Guild in Cyrodiil. Though his initial attacks were successful, his cult failed to destroy the Mages Guild, and Mannimarco was killed by the Mages Guild's newest Arch-Mage with the help of the previous Arch-Mage, Hannibal Traven. Mannimarco's evil began spreading throughout Tamriel and he gathered a following of Necromancers. He is described in a poem as "world's first of the undying liches". Considering there were other humanoid liches before him (for example the Ayleid King of Miscarcand) it is possible that "first" may be simply a poetic way to indicate he was the most important or most powerful. He lost his body and mind; he became a living, moving corpse. His blood became acid, and all manner of repulsive things happened to him. Galerion left the Mages Guild, calling it "a morass" of political infighting and tortuous bureaucracy. Galerion attacked Mannimarco in a great battle, where he called Mannimarco "The Worm King". While it appears Mannimarco had his nickname, if in an altered form, at this point, it may be extrapolation by the author. Mannimarco began to unleash incredibly powerful death spells. However, he felt his depraved powers fail, and the battle was won by the Guild. Approximately a thousand men total died in the battle, Galerion included, and it appeared that Mannimarco had died as well. In 2E 579, Mannimarco was one of the original Five Companions whose goal was to find the Amulet of Kings. When they found the amulet, Mannimarco tricked them into using it to cause an event known as the Soulburst. 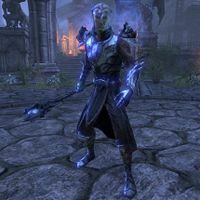 The Soulburst would allow Molag Bal to merge Nirn into his realm of Coldharbour, forever placing it under his control. Mannimarco, however, was secretly trying to take Molag Bal's place and become a god. In 2E 582, he would go on to be defeated by the Soulless One after the Five Companions had been reformed. 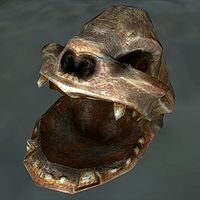 Whatever occurred during The Warp in the West, a powerful necromancer calling himself Mannimarco surfaced years later during the Oblivion Crisis to stage a widespread assault on the Mages Guild in Cyrodiil. It is likely he chose this time to attack because he had a strong following (after Hannibal Traven's ban on necromancy in the Mages Guild took effect) and because he believed the Oblivion invasion would weaken and distract the Mages Guild. As noted before, this threat was eliminated personally by the Mages Guild's newest Arch-Mage and the previous Arch-Mage, Hannibal Traven. The Necromancer's Amulet (also known as the Necromancer Amulet) is a legendary artifact created by Mannimarco. In appearance it is an exquisite amulet, often with a skull emblazoned upon it. It grants the wearer magical protection equivalent to plate armor, as well as the ability to regenerate from injury, resist mundane weapons and absorb magicka. The wearer also becomes wise beyond his years and far more capable in the School of Conjuration. 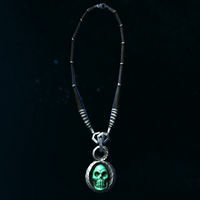 This comes at a price, as the amulet can drain the wearer's strength, endurance, health and stamina. 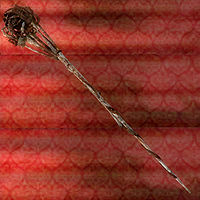 The artifact is popular among both thieves and mages. The amulet is unstable in this world, and is forever doomed to fade in and out of existence, reappearing at locations distant from that of its disappearance. By 3E 433, the amulet had been transported to the Arcane University in the Imperial City for safekeeping. With the return of Mannimarco after his ascent to godhood, Caranya of the Council of Mages turned traitor and took the amulet and her supporters to the abandoned Fort Ontus, where she intended to return the amulet to its creator, making Mannimarco nigh unstoppable. The Champion of Cyrodiil uncovered Caranya's treachery and killed her, returning the amulet to Arch-Mage Hannibal Traven. By 4E 201, long after the dissolution of the Mages Guild, the amulet had been discovered, and lost again, by Calixto Corrium of Windhelm after he had been driven to madness at the death of his sister Lucilla. Attempting to bring her back to life, Calixto turned to necromancy and intended to use the amulet in his experiments. The amulet was found by the Dragonborn, who was investigating a string of murders in the city, attributed to a serial killer called "the Butcher". The Butcher was none other than Calixto, who was eventually discovered and brought to justice. Esta página foi modificada pela última vez à(s) 05h23min de 30 de outubro de 2015.